It's one thing to love technology but it's a whole other thing to really commit. I mean really, wholly, commit. You can wire your house, install USB wall sockets, deck the whole place out in the latest and greatest gadgets. But then there's this. 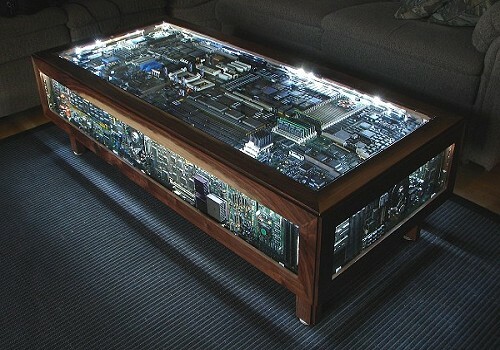 IMHO, it's the ultimate in geek furniture design. I mean, a table full of circuit boards? It's fascinating to look at -- like a puzzle built from retro technology. And as much as I love the lighting, I almost wish it had fibre optics built in so you could watch a pulse of light travel through the entire "system". Who needs TVs? Ok, maybe it wouldn't be as interesting to watch as TV (this coming from the chick who can't stop watching her Roomba) but it would make for an interesting conversation starter during house parties.